Prepare the LEGO® City 60198 Cargo Train to start hauling! Use the forklift to load the containers before lifting them onto the wagon with the crane. Hook all the wagons behind the locomotive, climb into the cab, blow the whistle and get rolling! Deliver the cargo on time and keep LEGO City running smoothly! Price is 28% below the initial Lego retail price, a € 54.00 discount! This comes down to 11.09 cent per brick. The Cargo Train (60198) Lego set is available from the sites below. However, they do not offer delivery to your selected region. 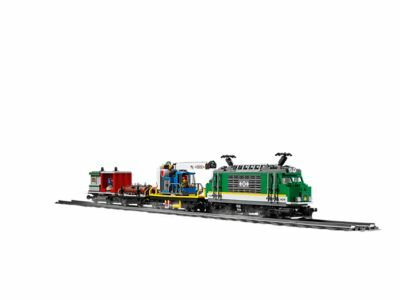 The Cargo Train (60198) Lego set is no longer directly available from the sites below. However, 3rd party partners of these sites might still have the set available. Alternate description Haul goods through LEGO® City on the Cargo Train! Includes 6 LEGO® minifigures: 4 train workers, a security officer and a crook. Features a motorized engine with 10-speed Bluetooth remote control, pantograph on the opening roof, and driver’s cabin with control panel. Also features a log wagon, crane wagon with rotating and extendable boom arm, and a container wagon with 2 containers with hooks on the roof for loading and space for pallets. Includes a control center with ladder and signal lights, a full circular toy train track with 16 curved rails, 16 straight rails and a railroad switch with lever, a money transport truck with opening doors, and a working forklift with opening roll cage. Accessory elements include a wrench, 12 gold bar elements and 4 money bills, plus 2 buildable pallets, 3 logs and snow scooter. Open the roof to access the engine car filled with cool details. Operate the cargo train with the 10-speed Bluetooth remote control. Lift and load logs onto the log wagon with the crane's rotating arm and hook. Push the lever on the railroad switch to drive the train to a different track for loading or unloading. Load pallets into the containers with the forklift before lifting them onto the container wagon with the crane. Set up the tracks in different configurations to load or offload cargo around your city. Cargo Train in total measures over 4” (11cm) high, 32” (82cm) long and 2” (6cm) wide.